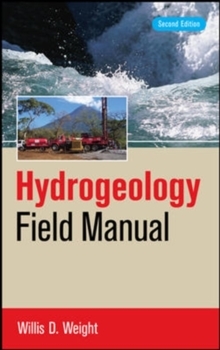 Dramatically Improve Your Hydrogeology Field Skills and Master New Advances in Groundwater Science The Second Edition of Hydrogeology Field Manual provides the latest information on applied applications in groundwater sampling and water-quality assessment, aquifer characterization, contamination issues, karst applications, and more. The book includes actual procedures, real-world decisions, and many examples and case studies to help you understand the occurrence and movement of groundwater in a variety of geologic settings. Filled with tips, tricks-of-the-trade, and anecdotes from seasoned field hydrogeologists, the book explains how to gain instant expertise in most field methodologies and expand your abilities for data interpretation ...and other essential skills.